My grandmother was a lady, and when I say that I mean she was classy. I have vivid memories of her visiting, and she was always flanked by beautiful suitcases that matched perfectly. She was the picture of class and elegance, and I always loved that image of her. All she needed was a pillbox hat and a mink stole, and she could have been a 1940s movie star! Now that I’m ready to shop for luggage, a well-crafted set that replicates the look my grandmother had would be amazing. I don’t think I would carry quite as much stuff as she did, but if I ever needed a lot of room to pack things for a wedding or similar event, I would really like to have something that’s coordinated and screams class. 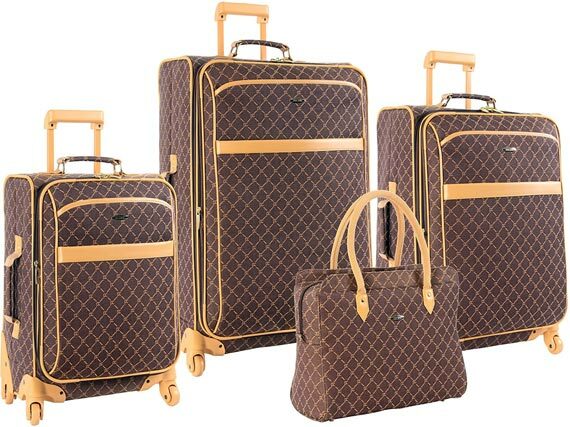 The Pierre Cardin Signature Spinner Four Piece Luggage Set has that look. It comes in two patterns that are similar in style but different in color. One is brown, and one is white – perfectly coordinated in my opinion. My grandmother’s set was big and heavy, and they had to be carried from place to place. This set is far more modern with handy spinner wheels and retractable handles however, the designer has still managed to exude timeless elegance. The set comes with four pieces: Two large bags of different sizes that have to be checked on the plane, a smaller carry on-sized spinner bag and matching tote. Each comes with a host of pockets and plenty of places to store your items. The tote is actually made to hold a laptop as well so you know your electronics are safe in a padded compartment. The thing I’m most drawn to about this set is it has the look of luggage that’s incredibly expensive, yet it comes in at well under $300. In fact, it looks like something you would have to pay more than $1000 for. I don’t really care about designer labels, but I like the idea of getting a lot for my money, and Pierre Cardin has got it right with these travel bags! Each suitcase comes with a smaller bag inside that can be removed in order to store things like toiletries that often need a home away from clothing (for obvious reasons). If the bag is part of the set, I’m more likely to remember it. I feel like I have lost my toiletry bag more times than I can count while traveling. A bag that integrates into the luggage, but can be removed makes it easier to remember where you’ve put it. The one slight negative I’ve come across is the size and stability of the biggest case. It may be too large to use regularly because the case is so large. The wheels are also larger and heavier. It would probably be hard to get the biggest of the set onto a plane with anything in it and avoid a fee for oversized luggage. While the aesthetics of the cases are fantastic, they are not made to withstand a whole lot of torture. They should do well with regular wear and tear, but the sides are not likely to hold up if there is too much put on top of the case while it’s lying flat. Obviously you should be able to keep your suitcase out of trouble, but somebody in baggage won’t know you’ve packed breakable items on the top of all your clothes! I think I have found the look (with luggage) I’ve been dying for my entire life. I loved my grandmother’s style and class, and I hope to someday have the same aura about me. Luggage that fits together in this way while still being gorgeous and classy would be a welcome addition to my travel routine. My only concern is that I don’t travel often, or far enough to warrant spending much on luggage. If you’re like me and like to “travel” in style without the price tag of Madison Avenue, you can find exactly what you’re looking for in this Pierre Cardin Signature Set.